Richard Ellis Talks Episode Reminder Get a sneak-peek into each new show, delivered straight to your inbox! The reason this radio show exists, is to share Richard’s talks about a God who is alive. A God who loves you. A God who wants to give you hope and a future. Hear Richard talk. Feel God. 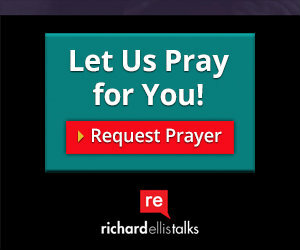 And if you’d ever want to ﬁnd out more about who God is, and how to get to know Him a little better, we’d love to connect with you, at www.RichardEllisTalks.com, or call us anytime at 855-6-RICHARD. Of course, Richard and his team would love to stay in contact with you on all the social media platforms. Just search for “Talk With Richard”, so we can keep the conversation going! Authentic... Genuine... Sincere... This guy is the real deal. He loves God. He loves his wife Rebecca and his 3 daughters. He loves people. He loves his job. He loves Texas BBQ. He loves an occasional round of golf. And he loves the Dallas Cowboys (but don’t hold that against him!). Richard grew up as a missionary kid in Brazil, coming back to the states to ﬁnish his education. He graduated from Baylor University in 1982 with a BA in Oral Communications, and earned his MDIV in 1985 from Southwestern Baptist Theological Seminary, making him the sixth generation of pastors in his family. His early days of ministry included serving for three years as the Single Adults Pastor at the First Baptist Church of Dallas. Then in 1997, Richard Ellis founded Reunion Church, a multi-cultural, multi-ethnic, non-denominational church in the heart of Dallas,Texas. Dallas needed a church like it. And it would need a pastor like Richard. So Reunion Church was born. And now the radio show and the website (www.RichardEllisTalks.com) join the Reunion Church community under the leadership of this guy. And we’re all the better for it!